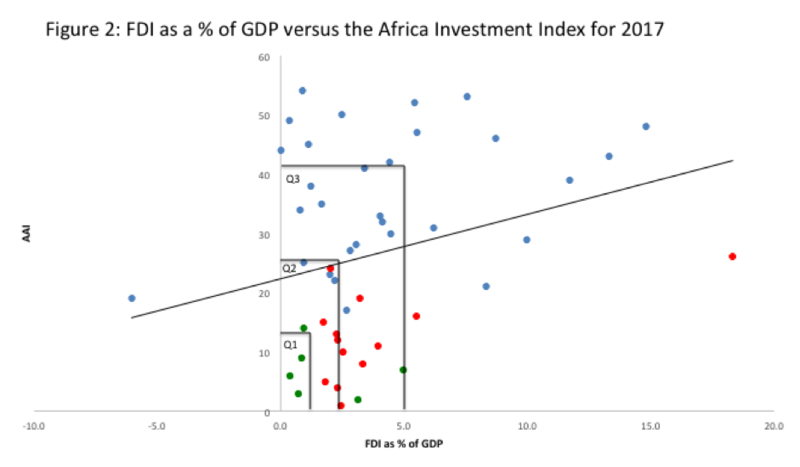 Despite having a large cumulative population, attractive rates of return on foreign direct investment (FDI) and a generally positive outlook for Africa’s economic growth, the continent is routinely ranked as the least attractive region for FDI. The 2018 A.T. Kearney Foreign Direct Investment Index asked more than 500 senior executives of the world’s leading corporations about their preferred destinations for FDI and not a single African country featured in the top 25 list. Additionally, the executives continued their pessimistic outlook of Sub-Saharan Africa from previous years. 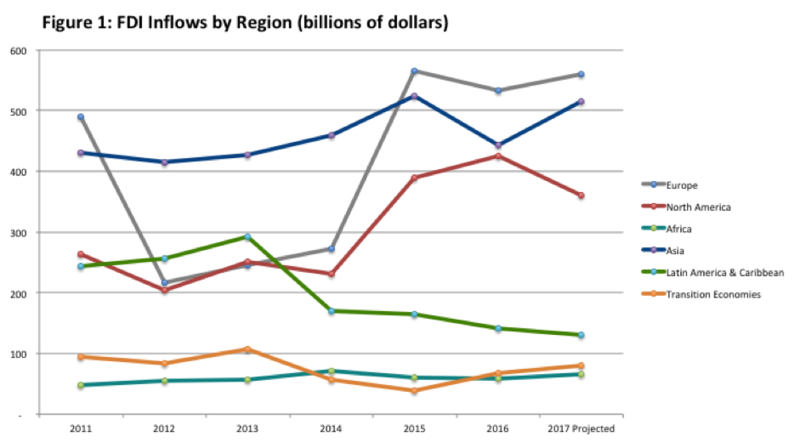 FDI inflows into Africa mirror the pessimism noted above and they have not exceeded the $100 billion mark in recent years, according to data from the United Nations Conference on Trade and Development (Figure 1). The existence of The Africa Investment Promotion Agency Network (AfrIPANet), drawn from 38 African countries and initiated by the United Nations Industrial Development Organization in 2001, has also been unable to champion Africa as a desirable investment destination. The Africa Investment Index, published by Quantum Global Research Lab, takes into account a country’s growth, liquidity, risk, business environment, demographics, and social capital. The Ernst Young’s Africa Attractiveness Index comprises six pillars that measure a country’s economic resilience, market size, business enablement, investment in infrastructure and logistics, economic diversification, and governance and human development. Given the similar methodology used by both Quantum Global and Ernst & Young, it is not surprising that the two indices feature a high overlap of top ranked countries. In fact, 11 out of the top ranked countries below are identified by both indices though the actual ranking of countries differs, as seen in the table below. A high FDI attractiveness ranking, however, does not necessarily translate into high FDI inflows as a percentage of gross domestic product (GDP), which is shown in figure 2. The seven largest economies in Africa are denoted by a green dot with Algeria, South Africa and Kenya falling within the first quartile (Q1). Just outside this box lies Nigeria, which currently ranks as the top economy on the continent. These countries as well as the others denoted by a green and red dot are all favoured by the FDI attractiveness indices from Ernst & Young and Quantum Global. In comparison, most other countries fall above the sloped trend line shown above. In many cases, countries receive similar FDI inflows as a percentage of GDP despite having a much lower FDI attractiveness ranking. Both Nigeria and the Central African Republic received FDI of 0.9% of GDP, yet the latter ranks 54th compared to Nigeria’s ranking of 14th in the Africa Investment Index. FDI attractiveness rankings are thus not good predictors of actual FDI inflows. To further explore this phenomenon, we examined the ten best and ten worst performers in terms of FDI as a percentage of GDP. This results in clusters of countries along the y-axis. One would expect politically stable countries to have a lower risk profile and thus be better positioned to attract FDI.However, this was not the case when measuring FDI against the Fragile States Index produced by The Fund for Peace. A case in point is comparing Kenya to South Africa which have vastly different ratings yet attract the same level of FDI as a percentage of GDP. Additionally, some of the most fragile countries on the continent received the highest inflows of FDI as a percentage of GDP. Finally, factoring in levels of human development of a country shows that several less developed countries receive more FDI than more developed ones. While FDI attractiveness rankings such as the one from Ernst & Young reward higher development, low levels of human development might signal investment opportunities and lure international investors. When examining global FDI inflows and FDI attractiveness rankings, it is apparent that African countries generally do not fare well in the global context. South Africa is the only example from the continent that appears in the 2017 A.T. Kearney FDI Confidence Index where it ranked 25th. Morocco is another exception and it ranked 20th in the fDiIntelligence Greenfield FDI Index in 2017. Other accolades go to Rwanda and Ethiopia, which each won AIM Investment Awards in 2018 for having outstanding investment promotion agencies. Moreover, we found that while the methodology for many FDI attractiveness indices seems intuitive and sound, the indices are typically not good predictors of actual FDI inflows. Instead, the analysis indicated that small countries emerging from post conflict situations, such as Liberia or Sierra Leone, often attracted the largest FDI inflows as a percentage to GDP. Mozambique is the notable outlier in Africa. While it too emerged from civil war in the early 1990s, it attracted massive investment through a new investment law and anchoring FDI into two mega-projects. As Africa is poised to continue its rapid development, it can no longer rely on its abundance of labour and natural resources to attract capital from international investors. This means that Africa based investment promotion agencies need to find new ways to bolster their FDI promotion programs. More importantly, investors need to recognize that opportunities exist in countries that are not rated well by traditional FDI awareness indices.